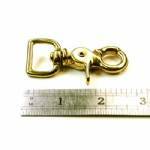 Solid brass scissor snap, 2 5/8" long, is suitable for medium duty uses such as dog leashes and bridle reins. The flat "eye" on this snap is sized for a strap 3/4" wide and up to about 3/8" thick. This snap will not work with round rope.